Grapes have had such an enormous impact on history and the economy that they’ve necessitated their own branch of scientific study. I’m referring to the science of Viticulture which involves the in-depth study and analysis of grape culture and production. However, we shouldn’t be surprised at this extensive research since grape cultivation has been around for over 8000 years. What’s surprising, though, despite the 72-million-ton global production of grapes is that very few of these numbers come from homegrown grape trees, or more accurately, grapevines. I’m here to tell you that growing and nurturing your own grape tree is entirely possible! With ample space in your garden, the right equipment and tools, and the steps and tips here, you can begin your adventure into viticulture! For healthy grape trees and bigger bushels of grape berries, you need to have some basic understanding of how the grape (Genus: Vitis) grows and proliferates. Hence, before you prepare your shovel and soil mix, let’s look at some grape facts. It’s a common misconception that grapes grow on trees. This misconception most likely sprouts from vineyard images of upright grapevines which then branch out to form canopies of branches. However, the vertical position of the trunk-like vines typically come from the support posts during the grapevine’s early stages of growth. Apparently, grapevines can be so aggressive that they can completely wrap themselves around a tree, and there, eventually bloom and take fruit. A little experience and know-how of basic pruning methods will go a long way towards a healthy and fruitful grapevine. Hence, it would be best to acquaint yourself with some of these techniques before and during your grape-growing adventure. Nevertheless, I’ll also include some essential pruning tips here too. There are hundreds of grape species and cultivars available for you to cultivate such as the Vitis labrusca and Vitis rotundifolia. However, for simplicity, we’ll be using the common grapevine, or Vitis Vinifera, as our species of choice in this guide. The best way to start your own grape plant is with grapevine cuttings. You can either purchase these online as well as your local nursery; or use cuttings from another healthy grapevine. Purchased grapevines will arrive as bare-root vines. You’ll have to soak these cuttings’ roots in water for about 3 hours before planting. If using cuttings from an existing plant, on the other hand, remember to take from vines that have been pruned. These cut vines should be around 3-4 nodes long (the bumps where leaves attach to the stem). Then, cut the bottom end of the vine at a 45-degree angle at about an inch away from a node. Lastly, consider using multiple cutting to improve your chances. After introducing yourself to the Vitis, you should determine the long-term location of your grape vine. I say “long-term” primarily because it will take around 1-3 years for edible berries to appear on your plant. Secondarily, Grape plants have markedly extended lives, spanning from 50 to 100 years. Therefore, your chosen spot for starting the plant will likely be its permanent home. Below are the factors that should influence you when choosing your grape’s home. Grapes love and need heat and a lot of sunlight. Hence, sunlight should completely expose your chosen spot while you avoid any areas that are in the shade at any point of the day. For instance, you should avoid spots near trees, tall plants, or buildings. This factors will be essential in establishing the plant, vine and root growth, as well as fruit maturity. Also, you can maximize sunlight intensity by planting the grape on sloped ground. Grapevines are generally forgiving with different soil types. However, they do demand soil that drains well and has pH levels of 5.0-7.0 Also, try to avoid overly fertile soil as this will affect future fruit yield. A good Soil pH Kit will be essential here. Grapes, being a vigorous vine, grow and thicken quickly. Therefore, you should prepare your preferred form of the support structure for growing grapes. This support structures can be trellises, arbors, fences, home-made lattices or other similar sturdy structures. Therefore, in varying stages of growth, you will need to provide grapevines with some form of support. We’re now ready to plant our grapevine! Heed these next steps on this stage of your grapevine adventure. Plant your cuttings after the frost, which would be in late winter or early spring. If, however, you acquire your cuttings before spring, I suggest you keep them cool and moist as you wait for the season to change. Consequently, a refrigerator would be ideal for this task. When spring arrives, rehydrate the roots before planting. Dig a hole with at least 10 inches of both depth and width then plant grapevine cuttings at least 6 inches apart. This space is essential for healthy root growth since grapevines have extensive root systems. Afterward, cover the vine with soil but do not tamp down. Remember, also to keep the soil loose and aerated. Water your vines’ roots thoroughly immediately after planting. Afterward, water at a minimum (moisten about an inch of soil near roots) but regularly for one week. This regular watering will help establish your grapevine. Fertilizing your grapevine is really not vital for the first three years, especially since excess nutrients can do more harm than good to your plant. Hence, limit feeding your grapevine unless it is essential. If so, apply small amounts of 10-10-10 fertilizer about 10 inches from the base of the plant. It’s common for grapevines to bear fruit just a year after planting. However, a young grape plant will not have the strength yet to support the weight of the fruit. Hence, in your grapevine’s first year, cut back on all fruit as well as most of the quickly growing vines. It may seem counterproductive, but mass pruning will mean a healthier and more productive grapevine in the future. So, don’t be afraid to prune the majority of the new growth, leaving only the strongest branches. It is not uncommon for gardeners to prune 70-90% of the grapevine’s new growth. Additionally, regular pruning will improve air circulation and sunlight exposure. Most importantly, remember only to begin pruning in late winter or early spring when grapevine is in dormancy. Otherwise, you will risk a bleeding vine. Every 2-3 years, check your soil’s pH levels so you can maintain it at the acidic levels of 5.0-7.0. Grape plants are typically hardy so you may end up using very little pesticide or none at all. Incidentally, you are better off removing any weeds by hand. Also, common grape pests are birds and small wildlife. If this becomes a problem, consider netting your grapevines to discourage any animal visitors. You’ve waiting a couple or so years, and now the time has finally come for you to enjoy the literal fruits of your labor! Just follow this last tip to make sure your grape berries are ready for harvest. Typically, a good indication of ripe grapes are berries that are deeply-colored, soft, and plump. However, the best way to gauge ripeness is to test a few of the berries. Consequently, ripe berries will taste sweet with hints of tartness. Take care to only pick enough berries for tasting since prematurely picked berries will not continue to ripen. Finally, once you determine ripeness, pick and enjoy! 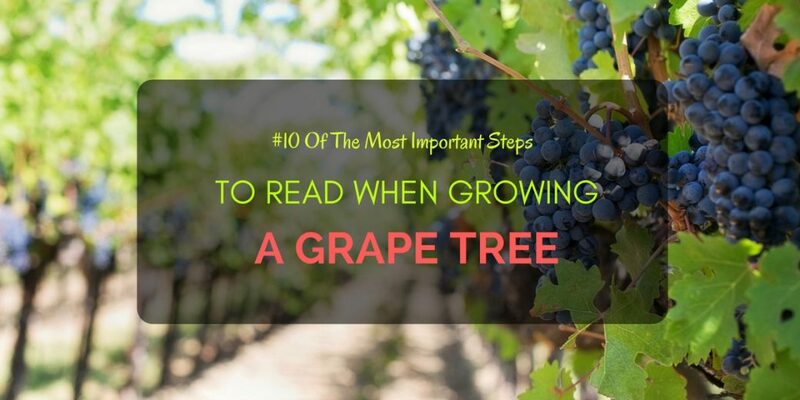 I hope you found this guide on growing grape trees or grapevines informative and helpful! If you have any suggestions or questions, please don’t hesitate to ask or tell us!